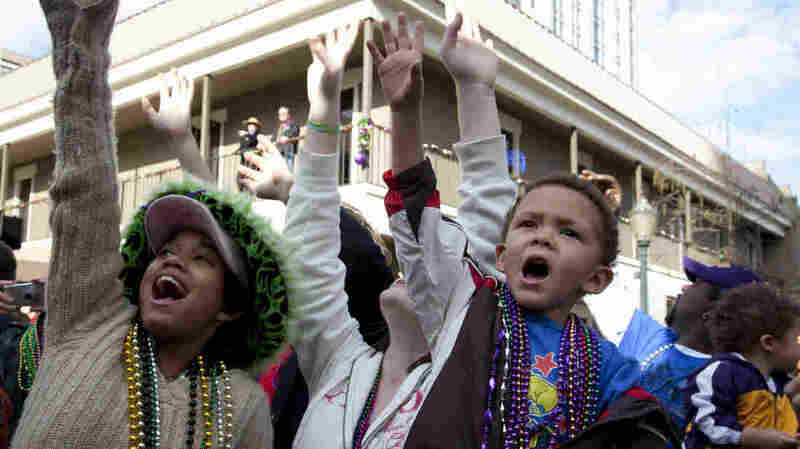 For Mardi Gras, Les Bon Temps Rouler In Mobile, Ala., Too Most people think of New Orleans on Mardi Gras. But the pre-Lenten celebration has roots in another Gulf Coast city. Mobile, Ala., proudly bills itself as the "mother of mystics." Mardi Gras Spectators in Mobile, Ala., in 2010. New Orleans is famous for its rollicking carnival to celebrate Mardi Gras, but the party has deep roots in another Gulf Coast city, Mobile, Ala.
And in Mobile, carnival rules this time of year, even in the city council chambers. "Good morning and happy Mardi Gras," says city council president Gina Gregory as she welcomes masked and costumed revelers for a special proclamation marking 185 years of street celebrations in Mobile. One of them is Wayne Dean, the city's semi-official Mardi Gras historian. But he's not Dean today. He's in character. "I am Chief Slackabamarinico from Rag Swamp," he says. With a headdress of turkey feathers and an oyster shell hanging from his neck, Dean turns heads as he walks from city hall to the nearby Mobile Carnival Museum. His costume is a replica of the one worn long ago by city clerk Joe Cain, who paraded through town with his Lost Cause Minstrel Band after the bleak days of the Civil War when Mardi Gras was suspended. "Union troops are still here and he kind of revived the spirit of Mobile by getting out in the streets and just making all kinds of noise and riding his wagon," Dean says. Cain was bringing back a tradition dating to the French settlers who founded Mobile in 1702, before New Orleans. Today, more than 50 masquerading groups stage formal balls, coronate kings and queens and parade on elaborate floats in the weeks leading up to Fat Tuesday. Mobile bills itself as "mother of mystics." Tens of thousands of people line the streets to see the spectacle and catch all manner of treats tossed by the maskers. Two young boys have set up early along a parade route, backpacks ready to collect the bounty. They have a plan. "Catch some footballs," says 8-year-old Daniel Wright. "I'm gonna catch some beads and moon pies," says his buddy Breylan Broom, 7. Reveler Bill Mann says it's all about the memories. He, his sons and nephew are in the same mystic society and ride together on a float. "You're in your own little world or whatever and the crowds there and you're feeding off the crowd and having fun," he says. Parade goers whoop and holler to get the attention of the maskers riding atop the colorful floats. "Throw me something, mister!" is a common refrain. On Fat Tuesday, schools and businesses are closed, and the biggest crowds turn out for a final day of revelry. It includes the famously long Mammoth Parade, put on by the Mobile Area Mardi Gras Association. Grand Marshall Marcus Catchings shows their signature Mollies Float. It features a giant and curvy paper mache woman with outstretched arms. "Big Mary right there," Catchings says. "There's nothing wrong with a buxom woman." The group was first founded in 1938 as the Colored Carnival Association, a group for African-Americans who were excluded from white mystic societies. It's still a predominantly black organization, while the Mobile Carnival Association remains mostly white. Catchings says they're proud of their history. "Everybody's unique and different," he says. "But at the end of the day everybody is Mardi Gras." The final parade Tuesday night is the Order of Myths, a group dating to the 1860s. Wayne Dean says their emblem is a jester-like character, Folly, chasing a skeleton-looking fellow symbolizing Death. "And of course, Folly always wins on Mardi Gras," says Dean. Death doesn't have a chance. Tuesday is Mardi Gras — Fat Tuesday — the final day of indulgence before Ash Wednesday and the penitent season of Lent.